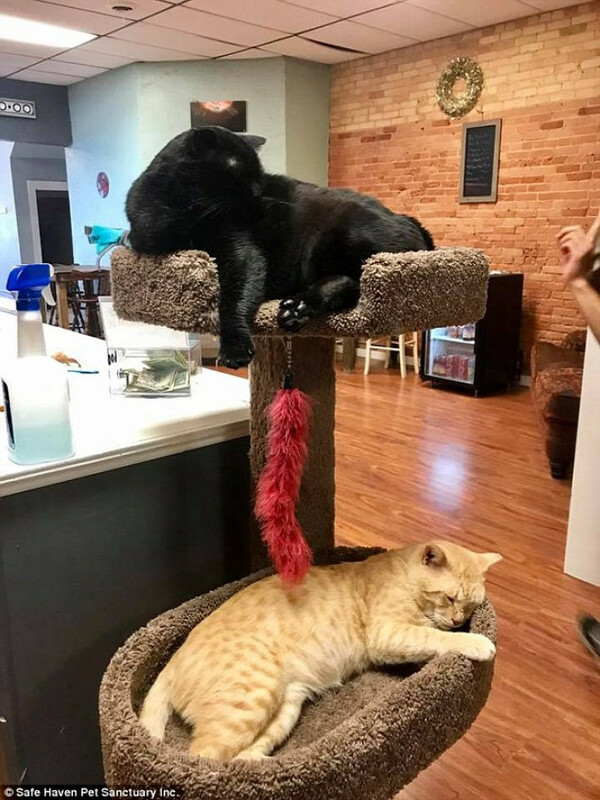 Green Bay, Wisconsin is known for a lot of things, usually football and cheese, but lately thanks to the Safe Haven Pet Sanctuary they're the talk of the Internet for the best reason ever! 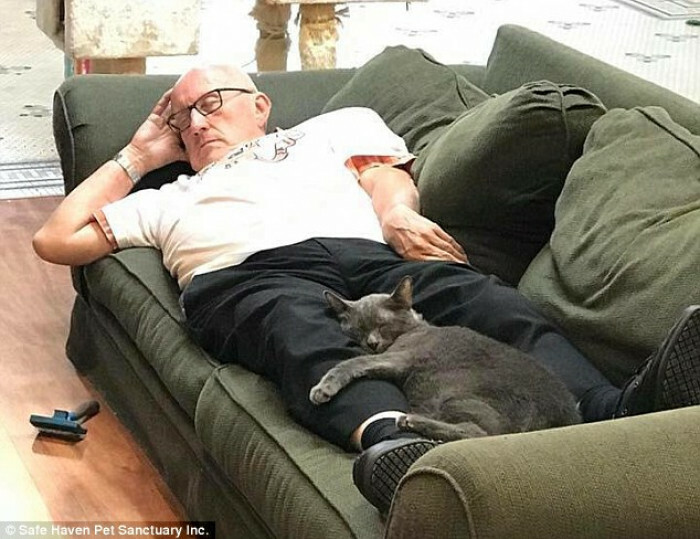 75-years old Terry Lauerman was "caught" catnapping on camera, but it's not the kind of catnapping you might have originally suspected. Terry isn't stealing cats, no, but he is stealing something: our hearts. 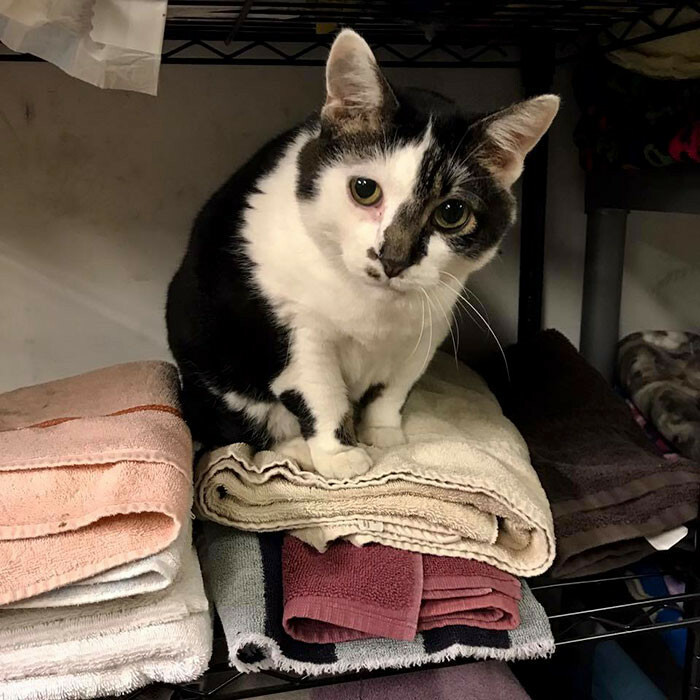 The shelter's founder Elizabeth Feldhausen recently took to Facebook to share the joy and delight she gets on a regular basis from watching Lauerman go above and beyond as a volunteer at her shelter. 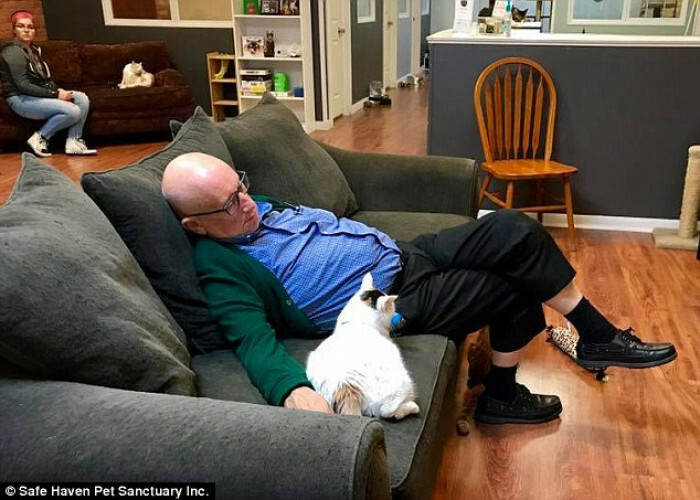 Terry is a beloved volunteer by both the humans around and the kitties but the photos have shown the whole Internet just how special his time is at Safe Haven. 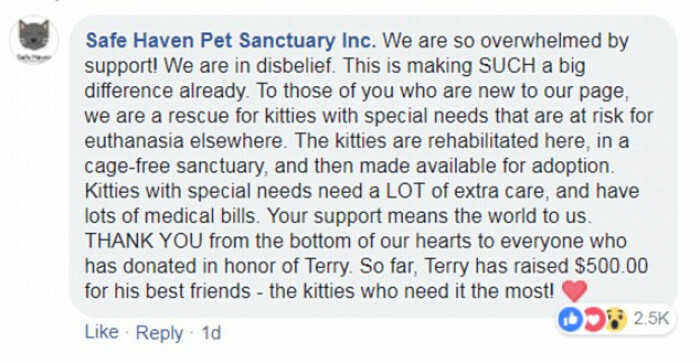 When Safe Haven Pet Sanctuary took to Facebook to share their delight with their volunteer, 75-years old Terry Lauerman, founder Elizabeth said, "We are so lucky to have a human like Terry. Terry just came along one day and introduced himself. He said he'd like to brush cats. Eventually, it became every day!" 2. But wait, there's more! Terry doesn't just fall asleep with the furry felines, he comes in to brush them and he knows them each on an individual basis, according to Elizabeth! Terry knows what each cat likes and dislikes, he's committed to their happiness in their time at the shelter. 3. Snoozing on the job? Yes, please! 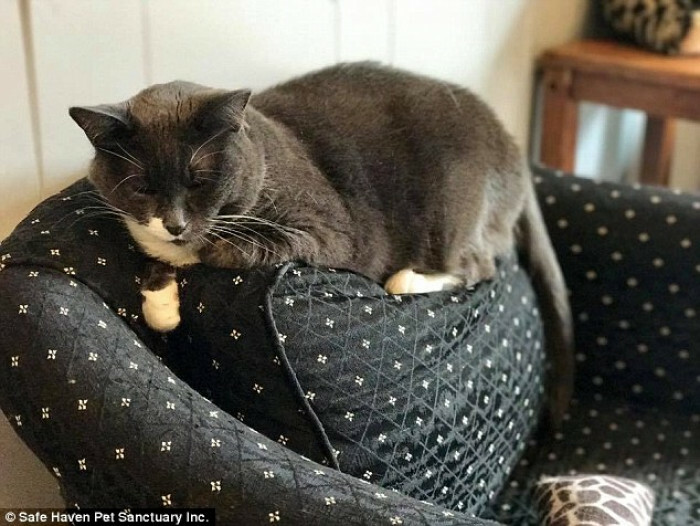 "He also accidentally falls asleep most days... We don't mind - Cats need this! 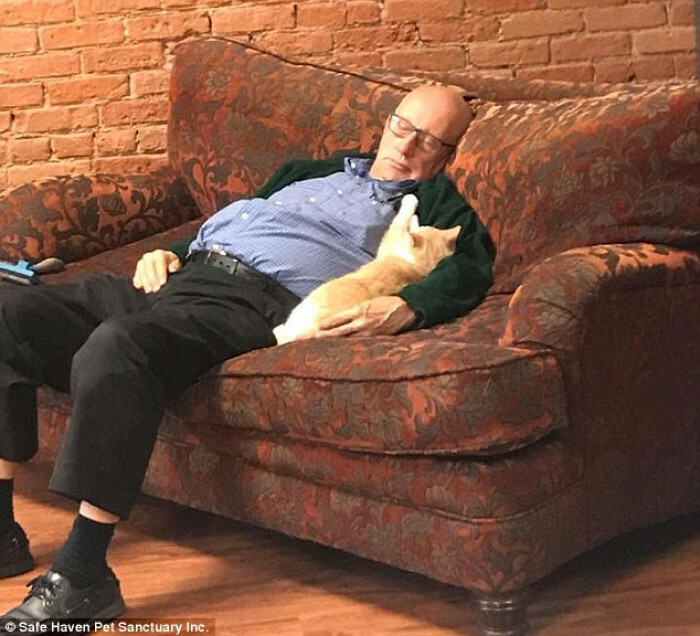 Terry is a wonderful volunteer #nappingencouraged #grateful." Seeing the heartwarming photos it's not hard to see why people were inclined to enjoy them! At this point, the post has received over 46,000 likes, over 7,000 comments, and it has been shared over 25,000 times! 5. And what does Terry think? Terry, apparently, is a very modest fella. 6. Will Terry comment publically? Nope! Terry doesn't bother with things like social media! He's just here for the cats, not the glory. And now thanks to Terry's unconditional love for the cats at the shelter, even more good has come from the experience! People began donating money! A brief fundraiser in honor of Terry and the viral post went on to raise $7,641 from all over the Internet! 8. Terry and the cats! Almost every single one of the 7,000+ comments was ecstatic about Terry and his cat naps. I mean, who wouldn't want to grow up to cuddle cats and go viral on the Internet for it? All the cat lovers dream of a job like Terry's. People who knew Terry in the community also commented, further testifying to what kind of a swell guy he really was. The world does need more men like Terry! 13. Volunteer work comes in all shapes and sizes. Sometimes volunteer work is cleaning, cooking, building, and hustling. And other times, it's just being present and loving a creature the way it deserves to be loved. 14. Brushing Cats: relaxation destination. Are you stressed out? Have we got a solution for you! Cat brushing. Does the soul good, relaxes the body and mind. The cats, according to those who have witnessed the adorableness, are just as into cuddling Terry as Terry is into cuddling them. 18. What's next for Safe Haven? As one commenter put it, "even in the best shelters I've been to, I've never seen a cat that felt safe and secure enough in a shelter to sleep-cuddle like this. As a cat-lover, my heart is very happy. As a mental health professional who's worked with lots of stressed and traumatized humans, I think Terry is giving these fur babies a tremendous gift." Well, we couldn't agree more!